For a long time after the launch of the iPhone, despite thousands of apps for just about everything you can imagine, there was no killer RSS reader app. That changed when the 2.0 version of Reeder arrived earlier this year. It’s so good that I often prefer using it to reading feeds in Google Reader, long my go-to RSS reader. And the iPad version is even better. And now it’s about ready to launch in beta for the Mac. While the blog Macstories did a preview back in September when the software was in early alpha, it has come a long way since then. And developer Silvio Rizzi has given me permission to do a short preview of what you can expect when the beta hits (sometime in the next couple of weeks, he hopes). I’ve been using the app for months now, and it’s finally feeling rock-solid. And it has completely replaced Google Reader for me. Of course, users of Reeder on the other platforms will know that it is built on top of Google Reader. You log in with your Google credentials and all of your feeds (and starred items) are transfered over. But Reeder makes the experience look roughly a million times better. The second pane contains the feed of stories by a particular site (or bundled folder of sites). This area shows you the title of the post as well as a short preview of the content. There’s also a check-box at the bottom to mark all items as read (or you simply hit “A”). The third (right) pane is where the content is actually shown. Again, with all the proper Mac styling, it just looks a lot nicer than Google Reader does in the browser. And here you can easily do things like star, share, make a note (tied to Google Reader), send to Instapaper (or Delicious, Pinboard, etc), and post to Twitter. The last bit opens a nice little tweet box that allows you to easily insert the title of what you’re reading and/or a link. This third pane can also be used to view the items as they appear on the web itself — and it’s actually a pretty nice way to browse. Or you can hit the “B” button and open any item in Chrome. There are at least a couple dozen other subtle great things about the app. For example, the dock icon can be made to show you the unread count on the side of its filing box (instead of an ugly red badge that almost all other apps use). And because it uses Google Reader as the backend, everything stays in sync between your various devices. 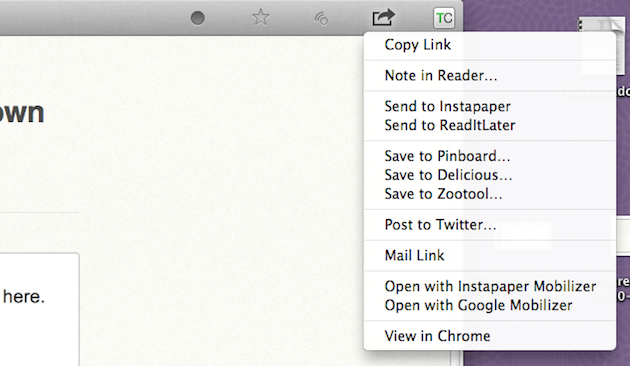 And with Reeder for Mac, all read items can be kept locally on your machine so you can easily reference them later. The one thing missing, sadly, is search. You’ll have to open Google Reader for that. Rizzi notes that he’s just working on feed subscription management now and then the app should be good to go. When it is, you’ll likely be able to find it here. I’ll be interested to see if Rizzi also makes the final version available in the Mac App Store. It seems like a natural fit. Will this beautiful app be enough to save the doomed RSS reader method of consuming news? Long-term, no. But it does make it a great-looking corpse.